In November 2014, our Operations Manager Phil Young handed over the keys of a retired Young’s to a good home shortly after implementing our Bus Recycle Program. This initiative is designed to support community organisations that can utilise one of Young’s retiring buses to deliver something back to the community. 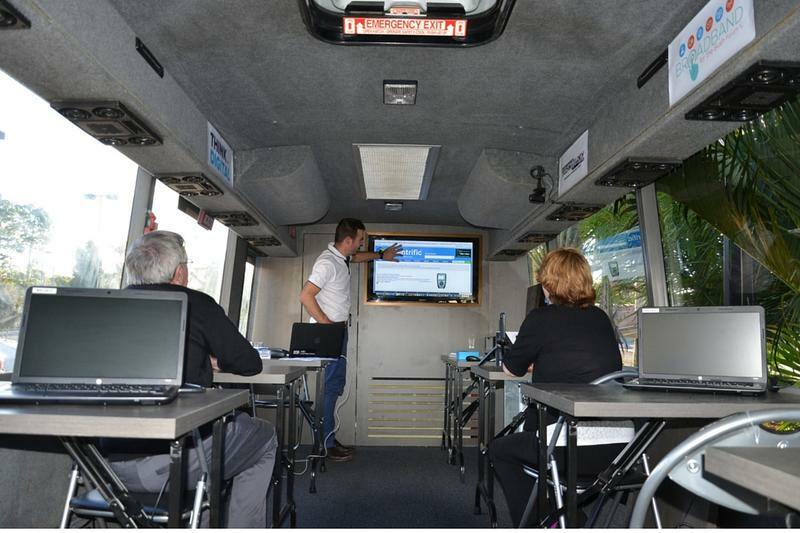 The digital classroom on wheels will feature some of the latest technology, including 3D printers, drones, mobile devices and wearables. There will be computer workstations and a large touch screen to host the classes on board. The fit out will be energy efficient and use solar energy. There are even plans to have the bus as a wifi hot spot that could reach a radius of 10km! In a little over 12 months, the retired Volvo coach has gone from transporting passengers throughout Central Queensland to transporting education to regional Australia. Tim and his #ThinkDigitalCoach are now ready to drive education programs across Regional, Rural & Remote Australia, bringing new technologies, accommodating school children in open space activities and offering fully equipped, hands on digital labs for teens, adults and seniors.